AVANCE Houston hosted their Board of Directors, elected officials, community members and corporate sponsors at a ribbon cutting for AVANCEs new Head Start Center at 2702 Aldine Westfield. Future plans for the center include adult education and job skills classes, tutoring services for youth, and a computer laball with the goal to create a hub of learning for the entire family. Keynoting the ribbon cutting ceremony was Congressman Gene Green. Other honored guests included Congresswoman Sheila Jackson Lee, State Senator Mario Gallegos and Dr. Alasdair McDonnell, a Member of Parliament for the United Kingdom. I am overcome with joy. Here at AVANCE there is a hurricane of spirit and commitment to education. AVANCE represents the building of confidence and the uniting of families. I am delighted to be a part of this day, Lee said. AVANCEs mission is to improve child well being through family learning and parental involvement in childrens education. 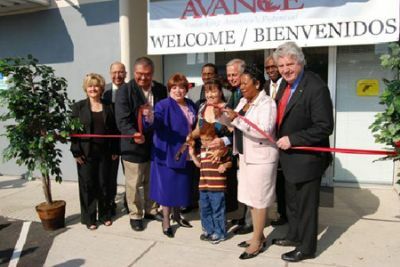 AVANCE, meaning advance in Spanish, has served the educational needs of thousands of lower income families since 1988. In addition to a total of 13 Head Start centers, AVANCE provides classes in parenting, adult literacy, healthy marriage, fatherhood, ESL, computer skills and GED throughout Harris County. AVANCE plans to incorporate these adult education programs in its Head Start centers to create comprehensive learning centers for entire families. The Aldine Optimist Club is busy with plans for the fall, including the Chicken Club program for 4th graders, and the benefit golf tournament. Chicken Club is a national program to inform young children of the dangers of drugs, and to set an example to avoid them. In the Aldine district, it is sponsored by the Optimist Club, and involves almost 5000 4th graders, from Magrill, Donn, and Bethune elementary schools. Clarence Johnson of Aldine ISD is in charge of the program, which includes a large rally on Oct. 23rd, with speakers and demonstrations. All participating children will receive a yellow tee shirt as evidence of their participation. 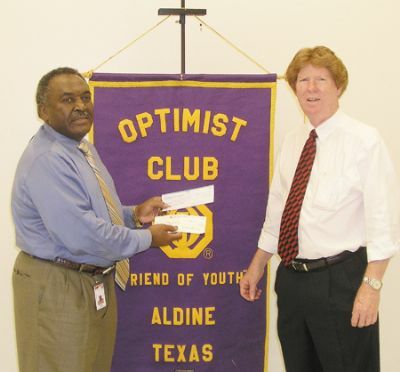 To support the program, the Aldine Optimist club raises money, and solicits donations from local businesses. At the luncheon this week, checks totallying $6700 were presented to Johnson by Steve Mead, club president, for the program. These included $4000 from the Optimist club, $1800 from the North Houston Bank, and $900 from Steve Mead. Mead noted in his presentation that the Aldine program is the largest one in the state of Texas, and has been very successful in attracting students with the no drugs message. Plans were also announced for the golf tournament, proceeds of which are also used to support the Chicken Club and other community activities. The Aldine Optimist Clubs Tee Up for Youth Golf Tournament will be held on Wednesday, Oct. 3 at Newport Golf Club in Crosby. The tournament will benefit the Aldine ISD FFA, the C.H.I.C.K.E.N Club, Special Olympics, Aldine Y.O.U.T.H., the Aldine Scholarship Foundation and the Aldine Pathfinder District. Registration will be held from 10:30 a.m. until noon. The driving range will open at 11 a.m., followed by a putting contest at 11:30 a.m. The tournament will begin with a shotgun start at noon, followed by a buffet dinner at 5 p.m. and the awards presentation at 5:30 p.m. The entry fee is $500 for a foursome or $125 for an individual entry. Banquet tickets for non-players are $25. Corporate foursomes, which includes a Gold Sign on the course, is $700. Gold hole sponsors are $300 and silver hole sponsors are $150. Mulligans (unlimited) can be purchased for $5 each. The entry fee will cover all golf fees, use of a golf cart, lunch and dinner for each player, on-course beverages and player gifts. Checks should be made payable to the Aldine Optimist Club and can be mailed to: 23020 Birnam Wood Blvd, Spring, TX 77373. For more information, or to reserve a spot in the field, call (281) 449-1800. 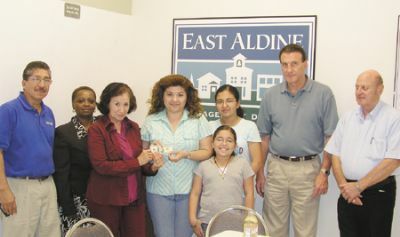 NORTHEAST HOUSTON About 100 entries were received in the recent Count the Trash Cans contest, sponsored by the East Aldine Management District and the Northeast News. Approximately half had the correct count, 48, and the others varied from 28 to 63. The winner was picked in a random drawing from the correct entries, and received a $100 cash award. The purpose of the contest was to raise awareness of the importance of cleaning up our own neighborhoods, said Maria Espinoza, board member and chair of the EAMD Clean-up Commmittee. She said that other efforts would also be used to get the publics cooperation in this clean-up effort. 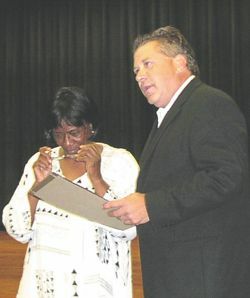 In the September 13th issue of the Northeast News, my good friend and fellow newspaper buddy, Bobby Horn, Jr. asked the question Where were you on 9-11? As with you it brought back some memories, in this case not many years ago but it also took me back many years about other, Where were You? questions. On September 11, Im sure I was among the last to know about that tragedy. As I recall the first plane hit the New York tower shortly after 9 a. m.( EST). I did not know about the event until just a couple of minutes before noon EST. Ive been retired from Union Carbide Corporation (a large chemical company of that day) since 1991. A few weeks before 9/11 some UCC officials had asked about 30 of us, all retired, to meet with a couple of company reps and discuss improving communications between UCC and its retirees. We met in a large conference room in a company building but only a couple of people knew we were there. We had entered the facility about 7:30 a. m. (EST). Not until we emerged a few minutes before noon to go to the cafeteria for lunch did we find out what had happened. As we walked into the lobby of the building it was filled with people watching on a couple of available TV sets. Like you, we were astounded Our work had ended and only lunch was left. 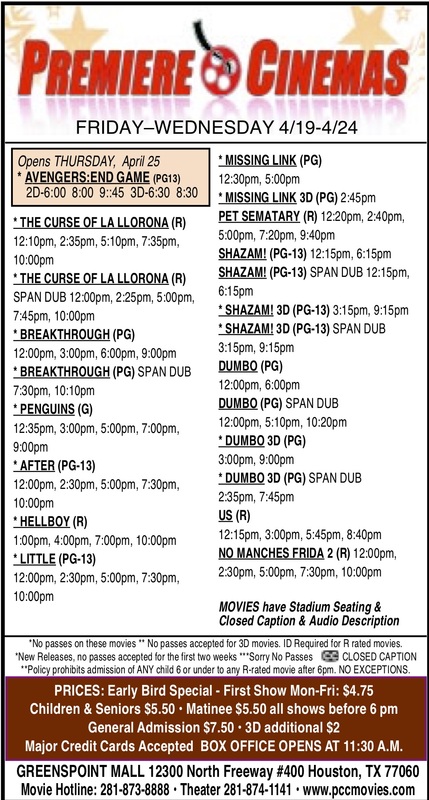 Some of us skipped this free lunch and headed for home. Those are the three memorable historic occasions of my life that are still quite clear. Others where were you, questions concerned President Roosevelts death while in office, D-Day, the day World War II ended and the day President Reagan was shot but not killed. They still stick in my mind but have less significance than the top threeparticularly Pearl Harbor. In the effort to reduce the dropout rate, Aldine ISD mobilized to encourage students to come back to school. The campaign had two phases. The first part had dozens of volunteers and staff telephoning the homes of approximately 1,500 AISD students who failed to show up during the first week of school. The phone-bank operation on August 30 and August 31 was in advance of the door-to-door campaign on Saturday, September 8 to encourage dropouts to complete their education. Volunteers and staff were able to reach hundreds of students or their families during telephone operation. The results of the phone calls also provided AISD representatives with data to map out the homes of 900 students who would be visited during the Reach Out to Dropout Walk. The walk proved successful as more than 300 volunteers that participated in the Saturday event reached more than 600 students, their families or neighbors throughout AISD. To help students register, all of the high school campuses were opened on the day of the walk. Of the students reached through the door-to-door phase, 15 dropouts enrolled that day while another 61 committed to enroll this week. More are expected to enroll or call to clear up student records. Reaching out to dropouts is not a one-day effort, said Ben Wilson, AISD assistant superintendent of community and governmental relations and one of the organizers of the campaign. There are many reasons why students dropout of school. In many cases, the families or students have moved away and failed to notify the school, thus leaving records incomplete or labeling the students as dropouts. For others it is a matter of life choices and personal or family circumstances. And even lost interest may have played a role in their decision to leave school. AISD has counselors, social workers and intervention specialists who can assist dropouts in completing their education. For those who work during the day, the Hall Education Center has a program that allows students to earn their diploma while attending school in the evening. And all of the traditional high schools assist students who are pregnant and want to complete their high school education. Reach Out to Dropouts receives strong support from district and national leaders. At this years event, U.S. 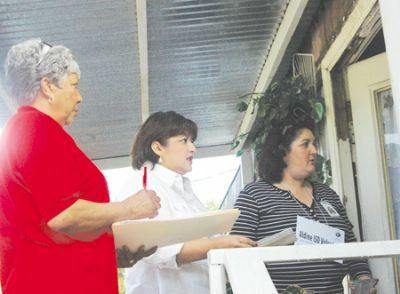 Congressman Gene Green encouraged the door-to-door volunteers at MacArthur Senior High School while many AISD administrators hit the pavement including all seven school board members. For more information on how you can volunteer in this effort, contact Ben Wilson at 281-985-6202. The Aldine Harris County Chapter of Grandparents raising Grandchildren held their fourth annual conference this week at the M. O. Campbell Educational Building on Aldine Bender. Attendees began the morning with greetings from Dr. Wanda Bamberg, Aldine ISD Superintendent and a tribute to Grandparents sung by Sidney Reed, granddaughter of the groups President Mrs. Shirley Reed. Texas ranks second among the fifty states in the number of households with more than 250,000 grandparents raising grandchildren. Frequently the custody arrangements with parents are informal leaving the grandparents with many legal challenges when they try to access needed educational, medical and mental health services for the children. The annual conference offered events for both adults and children featuring numerous professionals and public-service officials presenting workshops on a wide variety of topics. The group sessions for adults included discussions on legal issues, social service and well-ness programs, Social Security and Medicare benefits. The childrens sessions included topics ranging from Who Am I and Whats My Name? to Man, This School is a Drag and Breaking the Cycle. Local sponsors for the event included North Houston Bank, area businessman Steve Mead, Harris County Area Agency on Aging, Amerigroup, Evercare, and Jackson-Lee. Teachers from Hinojosa EC/PK and Head Start Center provided considerable support for the event. The hummingbirds are in migration across Texas on their way to Central and South America for the winter. If you have feeders up, you know what Im talking about. A magazine had a picture of a lady sitting and holding a small red container with hummingbirds gathered around on her finger. Great photo opportunity, so yours truly tried attracting the birds. They would hover about two feet from me but no closer. It is amazing to see a hummingbird that close and to hear the small bird with the drone sound of their wings flapping at 15  80 times per second. The hummingbirds paid more attention to me than getting a drink. While reading about the woman holding the birds, the article said it says it took a few days for them to get used to her hanging around next to the feeders daily for them to land on her finger. Didnt know it but hummingbirds are carnivores and the sugar water is just for fuel to power their fly catching activity. They have to fly south to get the bugs that cant handle freezing weather. Several years ago, yours truly walked up behind a hummer on a feeder and picked it up. Lil thing must have been sleeping as it was so easy to do and I let the Mrs. hold it for a second before letting it go. Thats bragging rights. This hot weather has brought my peppers into the production mode if they are picked regular. Granddaughter was here yesterday so she and the Mrs. picked peppers, bringing in nearly a colander full; mostly Tabasco Peppers by the front door and Cayenne from the back garden. Having that many peppers, I couldnt see letting them go to waste so I whooped up a batch of chowchow this morning using one head of cabbage and four yellow onions. No green tomatoes to be found at several supermarkets as they are scarce as hens teeth this time of year. Tried sampling some of the finished product with Fritos and only took two bites to say no mas. Not sure if allowing this batch to sit for six months or so will calm it down and take some of the heat out or not. Read an interesting note the other day it says, a persons true character is revealed by what he does when no one is watching. 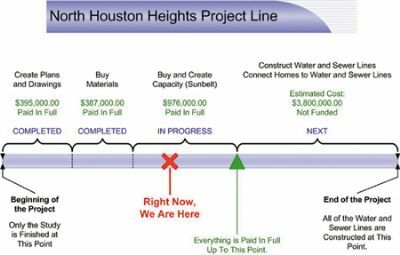 Residents of North Houston Heights recently gathered for a community meeting to receive an update on the water and sewer system that will be constructed for their benefit. The project to bring an older neighborhood in unincorporated Harris County a public utility system is the only project of this type in the state of Texas. The study that was completed in 2004 verified that many neighborhoods lack water and sewer service and have a high rate of septic failure, which leads to contamination of the water in shallow wells. The documentation provided information that is need for grants to pay for the cost of the construction project. When the system is complete residents will pay a water and sewer bill, which covers the cost of the systems maintenance and operation. The residents learned that Harris County applied for and received a $395,000 grant to pay an engineering company to design the water and sewer system. The original plan was changed after groundwater contamination was found on the east side of the Eastex Freeway at the site of the old Aspen manufacturing Company. The plans had to be changed to get the water from somewhere else. Since Sunbelt Fresh Water Supply District is so close to North Houston Heights, they were asked if they could provide water. They agreed to provide water and sewer treatment, if Harris County and the East Aldine Management District would pay to expand their system so they could supply water and sewer service to the neighborhood. The expansion to the systems cost $976,000 and is currently in progress. Construction materials for the next final phase of the project have already been purchased and are in storage but funding for the final phase of construction is still needed. According to Bailey several changes have been made to state law to enable the project to move forward, the most recent is House Bill 1314 that he wrote that took effect Sept. 1. The legislation protects projects to install water and sewer infrastructure in unincorporated communities that are either impacted by severe adverse economic conditions or named superfund sites that can have a positive impact on the quality of life of community residents. The change in law will allow the project to proceed without securing certification that typically would cost about $100,000 and take a year to complete. 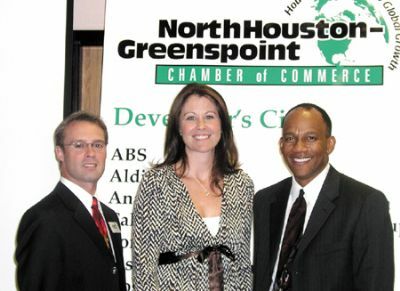 The North Houston Greenspoint Chamber had their monthly luncheon last Thursday, and heard from Tiffany Walker, from Reliant Energys supplier diversity department. Attendees at the luncheon learned how to approach a large corporation, and initiate contacts that could lead to supplier business. Walker gave advice on preparing your presentation, and having the correct qualifications and references for the work you are seeking. She said it is important to convince the company of your benefits and uniqeness. The Chamber has moved their monthly luncheons to the first Thursday of each month. The next Chamber event will be a Breakfast on Thursday, Sept. 13 at 7:30 a.m. at the Aldine AFT location at 350 N. Sam Houston Parkway. 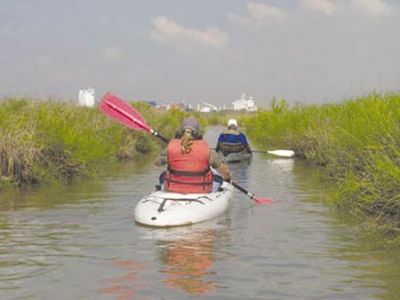 Last week the Port of Houston Authority, the Buffalo Bayou Partnership and corporate partner Shell Oil Company launched the Clean & Green Port of Houston program to restore Buffalo Bayou to a cleaner and more beautiful waterway. The year-round program is an environmental initiative that will use community service workers through the Harris County Supervision & Corrections Department to clean up litter and debris. Five days a week, a land-based crew will collect litter and debris from the banks of the waterway, while a water-based crew will work from a skimmer boat to clean storm drains, banks and other natural collection areas. The program aims to collect more than 10 cubic yards of debris a day over the next year  enough to fill 83 garbage trucks. The result: a clean and pristine waterway for the community to enjoy. The Houston area storm water drainage system carries street water and debris to curb catch basins that route the runoff through an underground system, which directly empties into the citys bayous. All discarded soda cans, plastic bags, Styrofoam cups and other litter from the streets enter into this drainage system. After a downpour, a tidal wave of trash flows towards the Port of Houston, and ultimately Galveston Bay, causing severe environmental problems. As the water level recedes to normal in the bayou, trash is left in the water, along the bayous banks, and hanging from trees and other vegetation. This recurring litter negatively impacts the environment, neighboring communities and the citys overall image. Phase one of the Clean & Green program will focus on restoring a seven-mile area along Buffalo Bayou from Shepherd Drive to the Turning Basin, and the Turning Basin through the Houston Ship Channel to the Highway 610 bridge.